CBT provides turn-key energy efficient solutions for commercial and industrial customers. Our experts take the hassle out of relighting your facility. We handle the details and let you enjoy the cost saving benefits without having to worry about material scheduling, contractor management, or rebate administration. System Design & ROI: A custom recommendation for an Energy-Saving Solution with ROI. After understanding the needs of your facility, CBT will develop a prioritized list of project recommendations. Each proposal and the accompanying return of investment analysis is thoroughly reviewed with you. 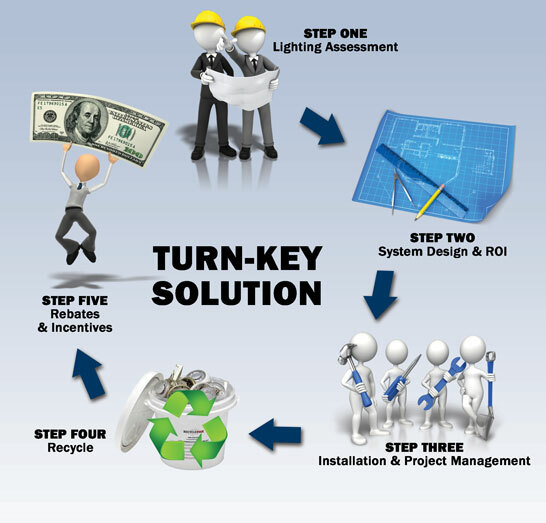 Installation & Project Management: A Turn-Key Solution. CBT has an established network of contractors and installation firms that can complete your retrofit project. Recycle: Ensure Compliance with Standards. After the project is completed, CBT will remove the existing fixtures from the site and recycle the lamps and ballasts as required. Rebates & Incentives: CBT Manages the Entire Rebate Process. With so many different programs available, it’s easy to get lost in the paperwork. CBT manages the entire application process for all available rebate programs, including Duke Energy’s Smart $aver Incentive Program and DP&L’s Rapid Rebates. CBT’s lighting specialists have experience with both prescriptive and custom incentive programs. These incentives will help offset the cost of the project. Updating old lighting fixtures is the sure way to increase efficiency and productivity while saving money in the long run. The proof is in the numbers.